Norwegian filmmaker André Øvredal made his mark on the cinematic landscape with the tense and memorable mockumentary Troll Hunter, set against the vast snowy backdrop of his home country. 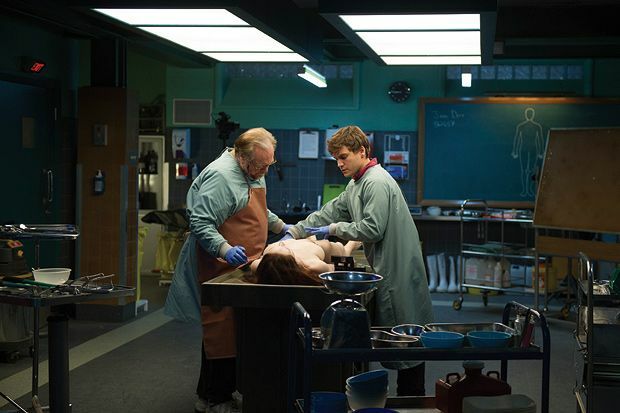 With his first English-language feature he swaps the giant white canvas for a tightly wound and playful chamber piece set in a walnut-panelled morgue in Virginia, starring Brian Cox and Emile Hirsch as father and son morticians. When the porcelain white corpse of a woman is discovered by the local police force with no sign as to the cause of death they deliver her to the Tilden Mortuary to solve the mystery. As the dark and stormy night wears on, the pair peel away the skin of Jane Doe (played by Olwen Kelly), revealing years of abuse and torture hidden deep inside – and so a suspenseful and bloody exploration of men's history of violence against women unfolds. Øvredal does a fantastic job at ramping up tension with creaks, bangs and the creepy sound of bells ringing, and up until the final throes he leaves his characters quietly aghast at the freakish and frightening occurrences. Hirsch turns in a particularly entertaining performance as he silently conveys his anxiety with bulging eyes of terror and WTF glances. He shares great chemistry with Cox, a master of the misty-eyed grumblings of a man hiding dark secrets and anguish. The duo's comic timing is also spot on. However, it's difficult to buy into the feminism of screenwriters Ian B Goldberg and Richard Naing when it's expressed by placing a silent, naked woman on a slab, ogling her pain and forcing the male characters to take it on. While there's so much to admire in the way this horror is fashioned and the fear it conjures up in the moment, what lies beneath doesn't sit quite right. For a more confrontational female perspective that similarly dissects an unjust society, try the Soska sisters' American Mary, a film that's unafraid to scream against the silencing of women. Screening on Thu 13, Fri 14 and Sat 15 Oct as part of the London Film Festival 2016. General release TBC.